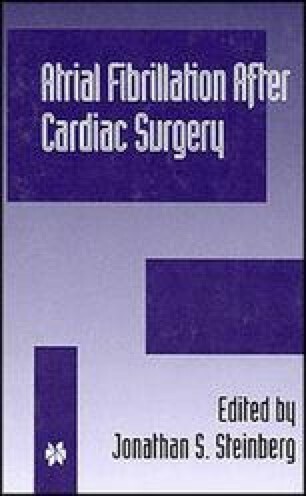 Atrial fibrillation (AF) remains one of the more serious and common postoperative complications in patients undergoing coronary artery bypass graft (CABG) surgery. An incidence of 10-50% has been reported in numerous studies over the last two decades [1-8, see also chapter 3]. Efforts to prevent postoperative AF have included refinements in intraoperative surgical technique, use of pre-, infra- and postoperative beta-blockers, prophylactic antiarrhythmic drugs, and multiple temporary cardiac pacing strategies.